Officials at the signing ceremony held in Dhahran. State oil giant Saudi Aramco said it has signed an agreement with global technology and innovation leader Raytheon Company to set up a joint venture aimed at providing best-in-class cybersecurity services across the region. Raytheon Company is a specialist in defence, civil government and cybersecurity solutions with headquarters based in Masschussets, US. The company boasts sales of $25 billion and 64,000-strong work force as of 2017. The joint venture company, which is being established with the help of Raytheon's Saudi subsidiary, will market and provide integrated defensive cybersecurity software and hardware capabilities, and perform research and development activities, said a statement from Saudi Aramco. The JV will help increase the cybersecurity protections available to the Saudi oil major besides its suppliers, customers and affiliates. It will also help build world-class cyber capabilities in Saudi Arabia and the region, it stated. 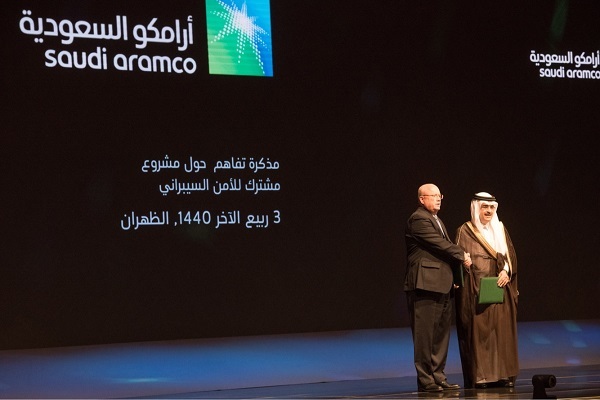 Saudi Aramco's senior VP for finance, strategy and development Khalid H. Al Dabbagh said: "We are excited about the joint venture which will support the kingdom’s Vision 2030 by creating highly skilled jobs for Saudis in the cybersecurity sector and will support the foundation for the country’s economic development." Demand for cybersecurity services is expected to grow as companies move further into the digital space and embrace technologies such as Internet of Things and big data, he stated. "The partnership with Raytheon will help strengthen cybersecurity and enhance its infrastructure in Saudi Arabia and the broader region," he added. “Cybersecurity is critical to national and global security,” remarked Dave Wajsgras, the president of Raytheon Intelligence, Information and Services. "This MoU is an important step in creating a joint venture that we see becoming the cornerstone of cybersecurity defenses in the region," he added.